This woman is an amazing DJ. Show business and music have always been a part of my life. For as long as I can remember, I have been watching my Dad doing wild stunts, starring in feature films, not to mention singing amazing records with amazing people. And boy, does he play a mean jazz piano. I never was one for science or mathematics, I was always the girl writing a play or playing the drums – I didn’t get a trophy at school for “Biggest Contribution to the Arts” for nothing. So how did I get into Djing? Well it all started in London 1997. I was introduced to House and Garage music and couldn’t get enough of it. And the people who had the best music were the DJ’s. Lucky for me, most of the people I met in London happened to be a girlfriend of a DJ, a friend of a DJ, or if I was really lucky, the actual DJ. I was on a mission, I wanted to know everything about it. The only way to really learn was to have all the coolest set up at home! That was it: I had my first set of decks and I was DJing, well learning anyway (apparently everyone sounds like galloping horses to begin with…) and I didn’t give up until I sounded perfect. Armed with my newly acquired skills and the beginnings of my now extensive music collection, I was ready. One night, I went to see a friend DJ at the exclusive Mayfair Club in London and fortunately, someone who happened to be organising a massive party on a yacht in St Tropez spotted me. The next thing I knew, I was on a plane flying out to play my first party to the elite crowds of the Mediterranean. Ever since then, things have just gone from strength to strength. I have been fortunate enough to travel to different gigs all over the world that my friends in London complain I am not here enough to satisfy their party needs! I have travelled to many places; from Hong Kong to Spain, Oslo to Miami, France to India and even to my home town in South Africa to rock the clubs. My DJing career has not only taken me to some great places but to some great clubs. One memorable event was a fantastic party in Lanzarote, where I played to a 2,000 strong crowd for MTV, in, would you believe it, a cave! It was such a crazy night. I was also lucky enough to spin in Miami at the annual World Music Conference with other amazing DJs such as DJ Heather, Justin Harris and House music legend Robert Owens. Robert loved my sound so much that he asked me to spin back in London with him at one of London’s House music hotspots, The Egg. One of the biggest highlights of my career was winning the Movida Corona London DJing Championship. I only had a ten-minute spinning slot to beat 20 other male DJs! Oh, and yes, I was the only female in the competition. Girl Power! In October 2008, I was given the huge privilege of DJ’ing for Simon Le Bons at his 50th birthday party and since then, things have got better and better with DJ bookings at Private Parties, Clubs and corporate events in the UK and abroad. Is there any stopping me? I doubt it! Along with Jamie Cullum and Mark Ronson and The Business Intl, DJ Lora headlined The British Olympic Ball presented by BT at London’s exclusive The Grosvenor House Hotel. Playing to a host of Olympic stars and celebrities such as HRH Prince Harry, Zara Phillips, Myleene Klass, Amanda Holden and Ben Shephard, even after the official evening closed, guests remained on the dance floor, with Lora rocking the after party which was exclusively hosted by London club Chinawhite. 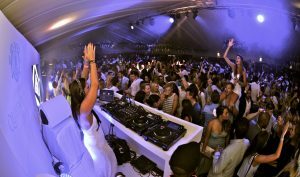 Following her set at The Alliance Ball, Lora jetted off to Milan to play at The Italian Grand Prix after parties for F1 Rocks. Held at Milan’s exclusive Just Cavalli bar, DJ Lora shared the stage with The Stereophonics and Seb Fontaine and played to host of Formula One racing stars and celebrities. Guests at The Alliance Ball were treated to an exclusive one hour set from DJ Lora, who filled the dance floor following performances from dance group Diversity and Jamie Cullum. The event, held at Battersea Evolution in London, benefited Unicef and was attended by over 900 guests, including Dragons Den star Duncan Bannatyne.